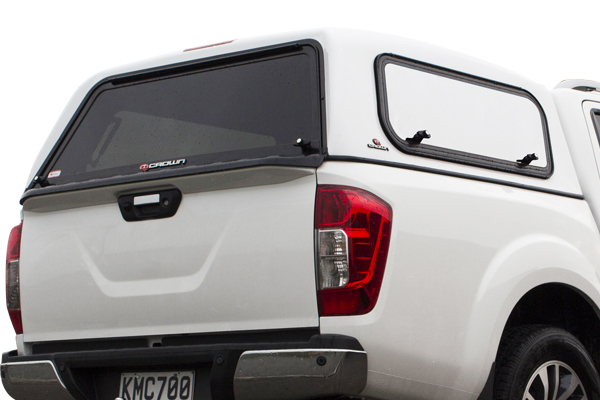 The Crown Canopy from Fully Equipped has endured the kiwi lifestyle, providing unmatched quality, reliability and practicality for over thirty years. Available for double, extra or single cab variants with the choice of window option tailored to requirement. Hand built from a single fibreglass shell, the Crown Canopy is a strong, impact resistant extension of the vehicle that provides a protected storage space for tools, gear and supplies. Internationally recognised with a 100kg load rating, and featuring a comprehensive range of accessories available, including roof racks and steel security mesh, the Crown Canopy is an ideal accessory for any utility vehicle. • Impact resistant reinforced fibreglass construction. • Smooth, high gloss, UV resistant exterior finish. • 100kg roof rack load rating (AS 1235-2000). • Comprehensive range of window options. • Modern midline styling, unique to each vehicle. • Designed and manufactured in New Zealand.